WikiLeaks is accusing U.S. Secretary of State John Kerry of trying to stop the site from publishing stolen emails from Hillary Clinton’s presidential campaign. Citing “multiple U.S. sources,” the site tweeted on Tuesday that Kerry had asked the Ecuadorian government to prevent WikiLeaks’ founder Julian Assange from releasing more documents. WikiLeaks claimed that Kerry had private negotiations with Ecuador last month. However, the U.S. Department of State is denying any involvement with cutting Assange’s internet connection. “While our concerns about WikiLeaks are longstanding, any suggestion that Secretary Kerry or the State Department were involved in shutting down WikiLeaks is false,” the department said in an email. News of Assange losing his internet connection comes as WikiLeaks has vowed to release sensitive documents relating to the upcoming U.S. presidential election. The site has been posting thousands of stolen emails from Clinton’s campaign chairman John Podesta, potentially helping her presidential rival Donald Trump. However, the U.S. government is concerned that WikiLeaks is releasing the documents as part of a Russian government-led campaign to influence this year’s U.S. election. In a rare move, U.S. intelligence agencies have publicly blamed Russia for hacking U.S. officials and political groups, in an effort to steal confidential documents and then leak them through sites including WikiLeaks. The Russian government has denied any involvement. WikiLeaks is also refusing to name its sources for its allegations about Kerry. Even so, President Barack Obama’s administration is considering a “proportional” response to the election-related hacking, which could include economic sanctions or even cyberattacks. 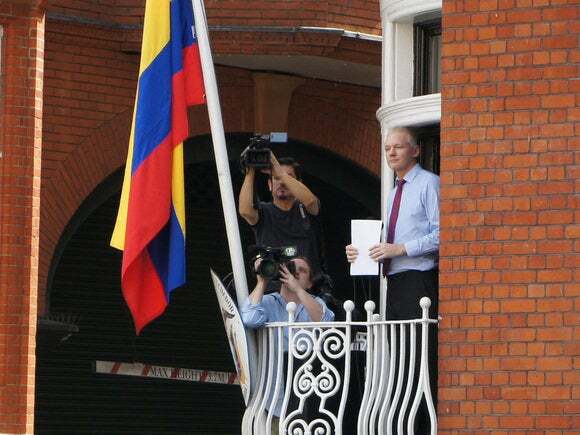 Assange has been residing in the London embassy for four years. The WikiLeaks site has already moved to contingency plans since he lost his internet connection and continues to release stolen emails from Clinton’s aide.